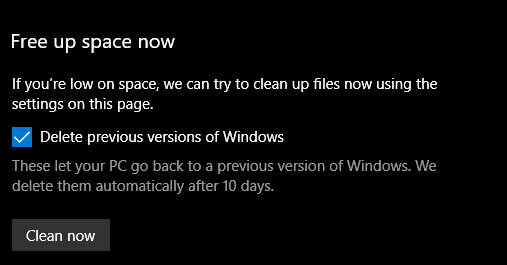 Last month’s update to Windows 10 added new tools for automatically and manually clearing clutter from your hard drive. Q. What is the difference between Disk Cleanup and Storage Sense to remove old files from Windows 10? A. Disk Cleanup is an older utility program that has been included with the operating system since the days of Windows 98. Until recently, the tool worked in Windows 10 much the same as it always did, scanning the drive and rounding up a list of all the unnecessary files and system detritus that you could delete with the click of a button. With a little extra work, Disk Cleanup could be set to run automatically, but some people chose to manually open and run the program when needed. On the Storage screen, you can see how much space you have left on your drive and turn on Storage Sense, which automatically kicks in to delete temporary files and items in your Recycle Bin after a certain period of time. Click the “Change how we free up space automatically” link to adjust the settings for how often Storage Sense cleans out old files. The most recent version of the operating system, the Windows 10 April 2018 Update, arrived late last month and further demoted Disk Cleanup. Now, if you want to dump old files immediately, you can just click the Free Up Space Now link on the Storage settings screen. The newer tool works much like Disk Cleanup, but it lives in the Settings app and has what some consider to be a simpler interface that is more in line with the overall look of Windows 10. You can still find Disk Cleanup by using the search field on the Windows task bar, but the little program’s time as a separate Windows system utility may be winding down.